The president of Mexico’s demand was absurd, of course; there would have been no such place as Mexico to be president of if it had not been for the conquistadores, and he was much more a legatee of them than was the prime minister of Spain. Perhaps he himself should have offered an apology to the pure-blooded indigenous people of Mexico, if he could have found any; but even if he had done so, he might have recalled that some of the indigenous people were on Cortes’ side. The Aztecs were not social democrats. If there is an economically sadistic desire of leaders to make other countries pay compensation to their own, there is also a pseudo-masochistic desire of leaders of other countries to apologize for the supposed past misdeeds of their countries, and thus open themselves, or rather the people they represent, to claims for compensation. If the hoped-for compensation is not forthcoming or if it is deemed insufficient, the result is more bitterness than if the apology had never been offered in the first place. This explains one of the many reasons for never going to law: the bitterness the whole procedure provokes. I doubt that one out of twenty actions for compensation ends in full satisfaction for anyone (except the lawyers, for whom it is more or less guaranteed). I am not against apology as such, of course, but its place in human affairs is limited and should be offered only by people who have some very strong personal connection with what is being apologized for. What is written without pain is rarely read with pleasure, said Doctor Johnson; likewise, an apology that is offered without personal discomfort or contrition is rarely counted as sincere, and is more personal psychodrama than meaningful gesture. There are, furthermore, many things for which apology is not adequate and is almost an insult. One can apologize for minor failings, for example after one has been rude to someone, and perhaps for minor crimes. I once had a patient who murdered someone while in a state of genuine madness, and when he came to his senses he offered the family of the man he had killed his sincere apologies. This did not bring back the man he had killed, and I doubt whether it was of much consolation to the bereaved family, but it was still the decent—perhaps the only decent—thing he could do. The apology of a mass killer who slaughters in cold blood, however, would mean nothing at all. “I now realize that opening fire at random on a crowd is wrong, and I apologize for having done so to all the relatives and friends of my victims” sounds, and indeed is, hollow, to say the least. 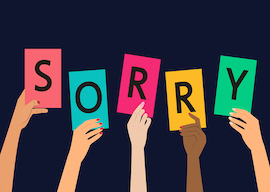 The mania for apology by people very distantly connected, if at all, to what they are supposed to be apologizing for is an aspect of the shallow emotional exhibitionism and dishonesty of our times. It permits the person who offers such an apology to imagine that he is doing something rather fine and generous while actually requiring nothing of him but the utterance of a few words. He does not even have to vow not to repeat the crime or do better himself because it goes without saying that someone as good as he, the apologist, would never even dream of doing anything remotely similar or as bad as that for which he is apologizing. Oscar Wilde said that a sentimentalist is someone who wants to have the luxury of an emotion without paying for it, and a modern apologist is someone who wants the aura of sanctity of making an apology without the need to feel any personal guilt. But he doesn’t mind in the slightest if his apology creates endless problems for others. The attempted recognition of the realities of the past is another thing entirely. Almost every country has skeletons in its historical cupboard, though it is important to recognize that in most cases the cupboard contains something other than just skeletons (I am not sure about North Korea, but that is a rather special case). However, as I know from looking inwards, there is a pleasure to be had in examining the moral disasters of the past that is far in excess of anything that such an examination could usefully teach us. You have only to go into a serious bookshop to see how many books are published on these disasters, examined, reexamined, and re-reexamined, without any real likelihood that they will prevent any future moral disaster, which will not be recognized as such until it is over. As every doctor knows who has made a mistaken diagnosis, it is easier to be wise after the event than during it. When we are reading about moral catastrophe, then, even when we have no particular ax to grind or material interest to advance, we as often as not are enjoying ourselves rather than seeking to improve ourselves morally. Serious books about moral catastrophes are the disaster movies of intellectuals.